We have developed a power package for the Golf VII GTI and Golf VII GTI Performance (type AU, from model year 2013). It consists of the REMUS Powerizer, a REMUS sport exhaust system with downpipe, front silencer and rear muffler as well as rear apron. The corresponding components are now available individually or in a package through REMUS. The new sport exhaust systems impress not only with the fully shot-blasted surface but also with its even more aggressive sound and in particular with its lightweight construction. This is achieved thanks to a reduction in wall thickness while keeping the same strength. The new muffler interior construction ensures a more aggressive sound. The fully shot-blasted surface made from stainless steel with aerodynamic optimized inner workings guarantees the maximum life and constant sound. The same applies for the exhaust system of the power package for the models Golf VII GTI and GTI Performance. 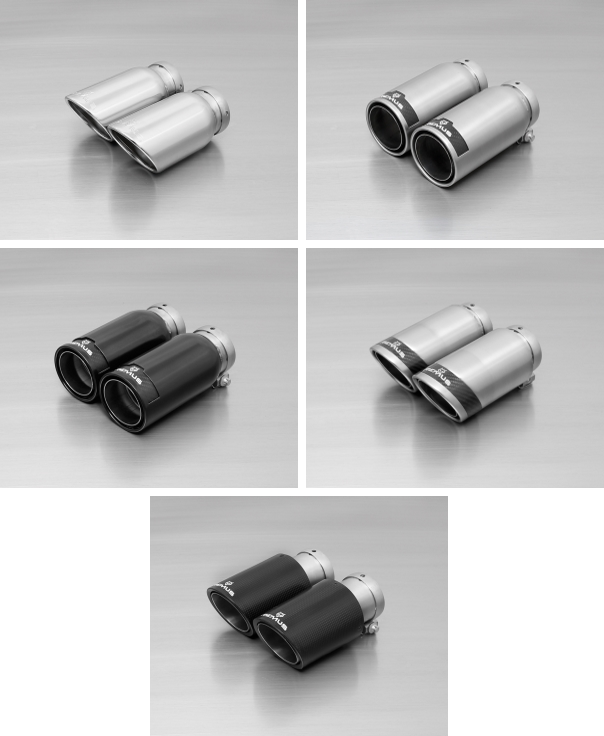 The silencer is provided with five fully adjustable slip-on tailpipes , which are available in five different designs, to give you the maximum individuality in configuration of your vehicle. Choose from chromed tailpipes (angle, 84 mm diameter), Street Race polished tailpipes (84 mm diameter), Street Race black chrome tailpipes (84 mm diameter), Carbon Race polished tailpipes (angle, 84 mm diameter) and carbon tailpipes (angle, 84 mm diameter) with titanium internals. 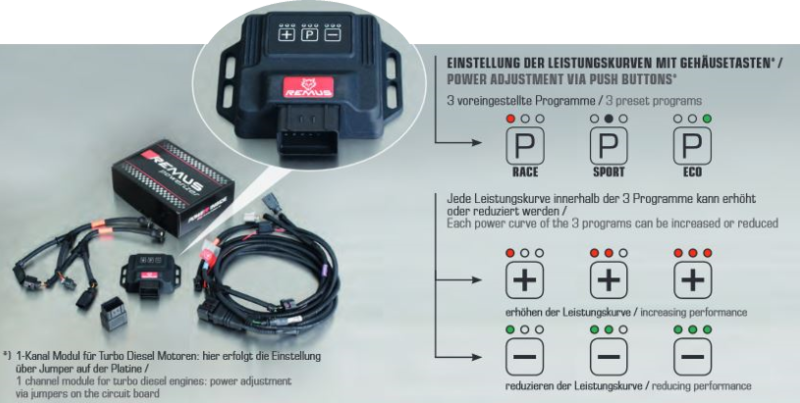 The electronics of the REMUS Powerizer enhances in real time the engine management parameter. The engine mapping is optimized multiple times per second and ensures for a considerable and noticeable power increase. The engine safety parameters and management remains totally original to ensure that individual engine components are not overstrained. Furthermore, the original mapping software remains totally untouched. Due to the Plug & Play concept, the REMUS Powerizer is simple to install and can be easily removed. Due to the torque increase, the engine has more power at lower RPM which leads to a reduction in fuel consumption. The power increase of the engine can be adjusted by using the push button switches on the control unit.